Contact City Vacuum & Sewing at cityvac@aol.com or call #206-365-999 for delivery shipping cost. Free in-store pick up available. Compact portability and convenience features unite in the Jem Gold 660. 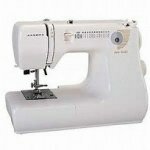 Quality components ensure reliability, including a jam-proof drop-in bobbin and horizontal full rotary hook. Convenient extras include a built-in needle threader, one hand thread cutter, and quick foot conversion. This 12 lb. machine offers 8 stitches, including 2 stretch stitches and a built-in buttonhole. Standard Janome quality and durability make this 3/4 size machine perfect for a first time sewist or as a quilting machine for taking to classes.